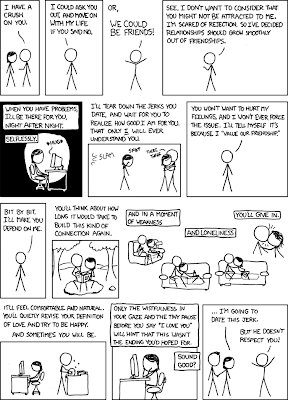 Brought to you by the perceptive folks at xkcd. Carr is Penny Sulzbach. Penny Sulzbach is Carr. I'm Penny Sulzbach. I won second place in the Baltimore City Comics Contest!!! And I totally stole my cat's name. I knew she'd be good for something. And Berd, by Penny Sulzbach of Forest Hill, takes second, and she wins $100 for her efforts. "Smart, dry, and not afraid to be cute, Berd is reminiscent of Peanuts without imitating it," DesHarnais says. "Little twists add to the charm." That's pretty much the nicest thing anyone's ever said about me. I'm super excited. I quit cartooning for the UB Post. I made this decision for several reasons, but mostly because the direction I'm going in with my work really wasn't working with what the Post wanted for their comics page. Maybe quitting was a bad idea, but I think this will give me more opportunities to experiment stylistically. It's kind of a shame too, because after starting this blog, I actually got feedback on my Facebook cartoon from a Post reader. Ah, well. For any Post readers who stumble upon this blog, I will try my best to post new work here at least once a month. Here's hoping my decision ends up being a good one! Yipes! One of the most hilarious alt comics out there today, the Perry Bible Fellowship, is coming to an end. That's sad. But on the other hand, it does free up a some space in the comics section. I'm writing to get my mind off things. I'm going to write about a movie I saw recently that I liked. Only good movies should be reviewed, unless you're Roger Ebert and your reviews of bad movies are hilarious. Persepolis is the biography of Marjane Satrapi, an Iranian graphic novelist who currently lives in France. The movie is based on her two graphic novels, Persepolis 1: The Story of a Childhood and Persepolis 2: The Story of a Return. After seeing this movie, it occurred to me how few movies there are that began as graphic novels and made it to the big screen as animation. Generally it seems the movie ends up being a live-action adaptation, particularly if the film is intended for adults, so I was happy that Persepolis was an animated feature. Probably not suitable for the office. Just sayin'. Stylistically it stays true to the graphic novel. It's black and white with the exception of a few color scenes that take place in Marjane's present. Aesthetically it's gorgeous. Marjane's touching coming-of-age story is intriguing, heart-wrenching and at times, funny. My friend Ean criticized it for having the grandmother as a more interesting character than Marjane. However, I don't see this as a flaw. Marjane shows the influence her grandmother had on her own personality, and uses her grandmother's wit and wisdom to show herself as a flawed character who has a need to learn, grow and mature. The reason the viewer likes Marjane's grandmother so much is because Marjane loves her grandmother, and in this movie she is sharing that with us. My only (small) criticism of the movie is that it was entirely in French. Now, I realize that this movie was intended for a French audience, and that Marjane currently lives in France, but the movie is basically about her learning to identify herself as being Iranian, and her love/hate relationship with the country she calls home. There is even a moment in the movie when she denies being Iranian and claims that she is French, only to regret it later. I think it would have been more conceptually solid if the Iranian portions were in Persian as opposed to French, but like I said, the movie was intended for a French audience, and I suppose French people don't want to read subtitles any more than American people do. Oh, and a note on the subtitles: Although in the clip I posted the white subtitles appear hard to read, in the theater version they had a black drop shadow and are easy to see, for all you seeing-impaired folks.